Perfect and protect your complexion in one beautiful step with the Elizabeth Arden Prevage Anti-Aging Foundation SPF30, a breakthrough in age-defying makeup. 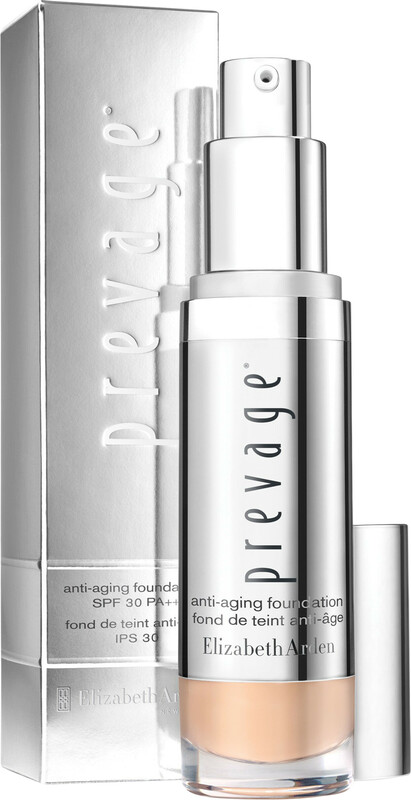 Smoothing, firming and radiance-enhancing, the Prevage Anti-Aging Foundation works continuously to make skin appear perfected from day to night, and back again. Its super fluid liquid texture glides across the skin seamlessly with a lightweight feel that is supremely comfortable. Its light to medium coverage finish ensures that imperfections are flawlessly diffused, whilst skin still appears natural and fresh. At the heart of the formula are moisture-boosting hydra-pigments and a brightening infusion of vitamin C, plus a complex of antioxidants that protects skin against visible signs of ageing. It’s your complete answer to fresh and luminous skin perfection day after day. Elizabeth Arden Prevage Anti-Aging Foundation SPF30 is rated 5.0 out of 5 by 1. Rated 5 out of 5 by Cavalier from Smooth and Youthful I was very impressed with this foundation. It is very liquid but a little goes a long way and it blends wonderfully. I peronally use it lightly but I can see that if you preferred you could get a heavier coverage. It lasts all day and makes the skin look wonderful. I purchased shade 3 which makes me look slightly tanned and so I think I will go lighter for the winter. I do wish you could get samples so that you don't waste your money choosing the wrong shade.